It’s easy to get stuck living a nominal life. As Christians, God calls us to live a phenomenal, because He is phenomenal. Being born again means being born from above. God has to work in our heart and mind to change us from within. This always involves bearing our cross; but how do we bear it? By being born again. Looking for a short summary or sermon takeaway? 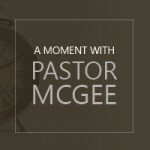 Check out our sermon audio clips, in a section we call A Moment with Pastor McGee. The mission of Jesus was to please God the father. That’s our mission too. Do people know that’s your mission by your actions? Believing in God is not believing in a higher power or a force. Belief in God is manifested when we are totally wrapped up in the things of God and our life is centered on Him.